This print was commissioned for the 20th Anniversary of the Operation Gothic Serpent in the Battle of the Bakarra Market. 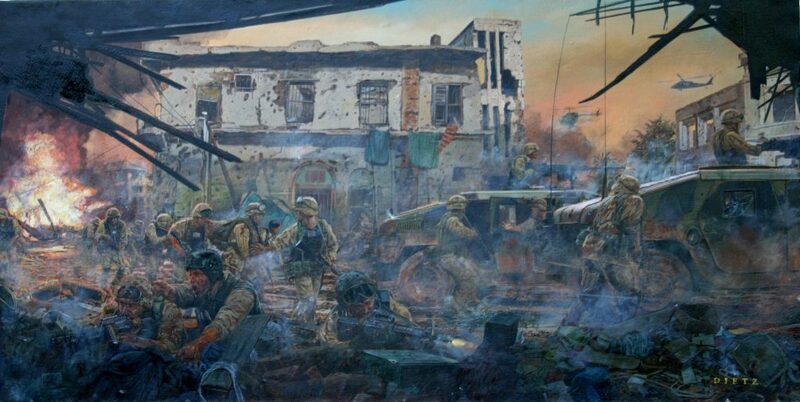 The print was created by the renowned military artist, James Dietz. You are purchasing a limited edition, signed, numbered military edition of the original oil painting. Prints are shipped with a matching numbered certificate of authenticity. In the summer of 1993 an elite special operations package called Task Force Ranger was deployed to Mogadishu, Somalia to find and capture a criminal warlord named Muhammed Farrah Aideed. TFR was an un-precedented and formidable fighting force made up of U.S. Army Commandos, Army Rangers, Air Force Special Ops, Navy SEALS, and Nightstalker helicopter crews. On the 3rd of Oct, TFR launched a daring daylight raid into downtown Mogadishu where a number of Aideed’s top officials were meeting in secret. The initial raid was a success. The assault force, inserted by Little Birds and Blackhawks, took the enemy by surprise capturing two dozen prisoners. The ground-reaction force arrived on HUMVEES, loaded the prisoners and headed back to base. The assault force of about 80 men was waiting to be ex-filled when the first Blackhawk was hit. The radio exploded in a high pitched oration of what everyone on the ground was well aware of. “We have a Black Hawk going down! We got a Black Hawk going down! We’ve got a Black Hawk crashed in the city!” Super 61 piloted by Chief Cliff Wolcott had been hit by an RPG and crashed about five blocks from the target building. The mission had changed. All elements were now rerouting to the crash. The Combat Search And Rescue(CSAR) bird immediately inserted a team to secure the crash. At the same time, the assault force was moving on foot from the target building. The ground-reaction force was trying to turn the vehicles around to assist, but they were taking heavy casualties in the narrow alley ways and crowded streets. Because the pilot’s body was trapped in the wreckage, and because casualties were mounting rapidly, the men defending the downed Blackhawk would need more help. As the fight moved into the night, a TFR rescue convoy was assembled which included the US Army’s 10th Mountain Division, Malaysians and Pakistanis. They finally broke through to the crash site late in the night. The pilots body was freed from the wreckage and the wounded men were loaded on vehicles. As the sun began to rise, those who were left, had no choice but to run out on foot. “The Mogadishu Mile”, as it came to be known, is the scene depicted in the painting. Super 61 was scuttled as the last of the assault force and vehicles left the crash sites. It is important to note that this battle was the first time in the history of special operations that Commandos and Rangers fought side by side. Outnumbered 10 to 1, the men of TFR distinguished themselves in an 18 hour fire fight that would later be recounted in the book and movie “Black Hawk Down”. Nineteen Americans were killed and 78 were wounded in some of the worst urban combat seen by US troops since WWII. Four helicopters were shot down that day. The heroics of the men in the air and on the ground, fighting to save each other, is an extraordinary story of courage and commitment. To this day, Task Force Ranger is the most decorated special operations package in military history to include two Congressional Medals of Honor, one Air Force Cross, 5 Distinguished Flying Crosses and three dozen silver stars.